UK – A 1940’s scene – at “Linch & Redford ”, near a railway bridge at the cross roads to Linch & Redford (as if the proposed railway line from Midhurst to Haslemere had been built)+ allotment, war memorial. The village Hants & Sussex bus on its way to Midhurst or Petersfield, waits for the afternoon train carrying shoppers & school-children home from Midhurst & an Army truck waits for new conscripts to the training camp at Cartersland. They have travelled from Waterloo to Haslemere where they changed onto a connecting train to Midhurst. The scene is set near where Fernhurst & Linch roads meet. I have assumed a station to serve Linch & Redford near to Linch Church. On the proposals held at West Sussex Record Office* a station was proposed at Redford. As the line appears to be in a deepish cutting, I have assumed a move to a more convenient location for the railway builders, if not for the Redford passengers. As part of this electrification project, which was completed in early 1939, the Southern revamped the provision for passengers with standard SR concrete construction for a new island platform, provided electric lighting and an access subway and stairs to a new small station building built at ground level onto the side of the embankment. Provision for a lift was made, but not installed. I have also assumed that the SR have carried out additional works, with war threatening, so that the line could be used as a diversionary route for freight & troop trains during WW2 and had extended the passing loop originally planned to 300 yds. with an austerity signal box* to allow for the increased traffic to be be handled over this single line. 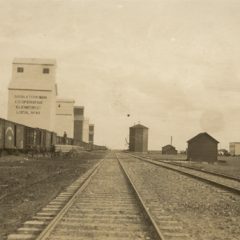 The passing loop at Linch & Redford was therefore considerably longer than needed for the 2 or 4 car car trains that would have been the regular fayre for this line. The new island platform was however kept to around 250 ft., as the longer trains would be either freight or troop trains not stopping at the station. *The signal box will be a modified SR type 14,(similar to that used at the Froyle WW2 food depot- a wartime standard) & will be mounted near the platform. It is not currently to be shown on the diorama, awaiting more details. The Southern no doubt expected the area adjacent to the station to be soon filled with modern detached houses, to provide Guildford, London or Portsmouth commuters for their trains. Unfortunately, within months of the works being completed, the Second World War was well underway with the line providing routes for Dunkirk evacuation trains. Planning restrictions after the war stopped any likelihood of suburban development in the area. The station, even in the 40’s, stands rather incongruously in its very rural surroundings, awaiting more commuters than ever appeared. 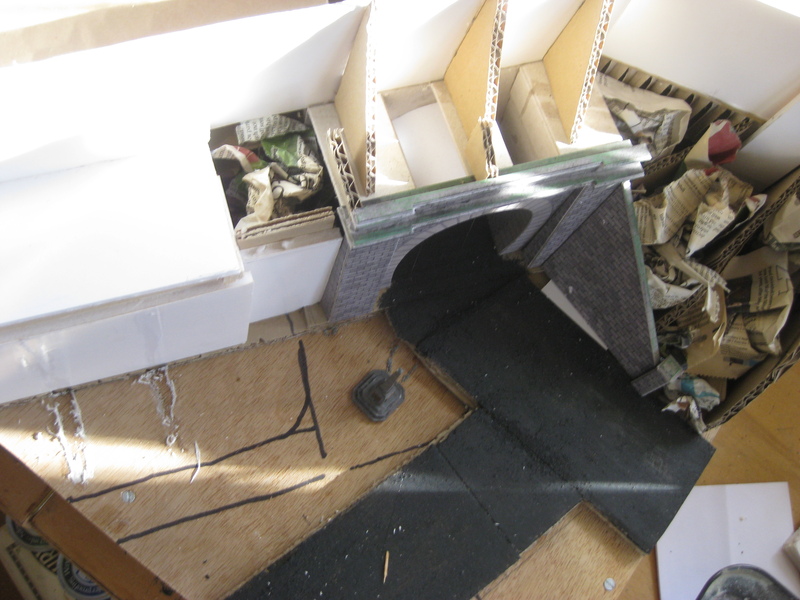 7th August 2016 Work is underway on the diorama- the base from some old scenic sections of Weyford, cut down & joined together to form a reasonable size, with a new top using s/h ply and reclaimed screws. The embankments across the Milland Valley would I believe be quite high, which gives much the same impression as the Winchester to Alton line did as it crossed Springvale Road, Hookpit near where I was born & lived for my first 9 years. 10th August Found an old Metcalfe tunnel mouth ex Weyford & have used this plus its sister- (unmade) to form the road tunnel through the railway embankment. 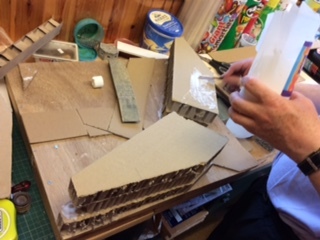 11th/12th August – base for station constructed. 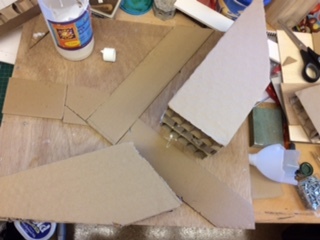 Foam base for track constructed and strip ballast laid. 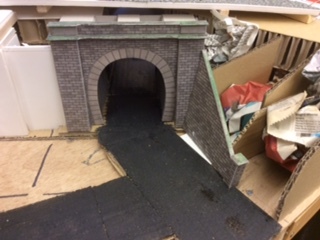 I’ve used a Metcalf single track tunnel kit- some bits taken from newer sections of Weyford- to use as the method used to take roads under railway lines on high embankments. There were several like this in the Winchester area (Kings Worthy/ Headbourne Worthy) and at least one on the Meon Valley line (A325 Petersfield to Winchester road near West Meon Hut. 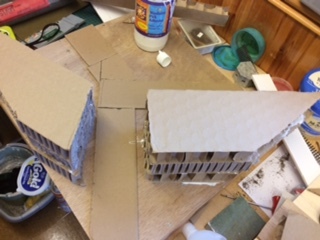 Retaining walls & all copings now in place together with some pastels weathering. Well there hasn’t been any for months. I wanted to complete it so that it could be on display at the Milland Memories weekend on 21st/22nd October as a “conversation piece”, but due to lack of exhibition space (& time) that didn’t happen. 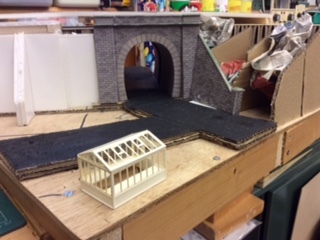 I might use it as “R&R” while the pressure is on for the East Hants Link layout, but more likely use it as an example of scenic treatment on the next Building a Model Railway (BAMR) session in November. So it is now officially a BAMR project! 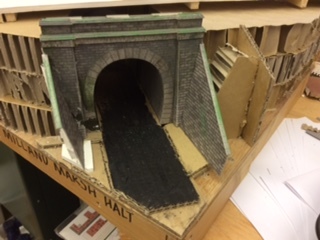 A little bit of a rethink regarding the height of the embankment- nearly doubled the height to give rationale for the road tunnel rather than bridge. It looks like any island platform will have to move slightly in the Haslemere direction, which gives the passengers a slightly longer walk from the subway. 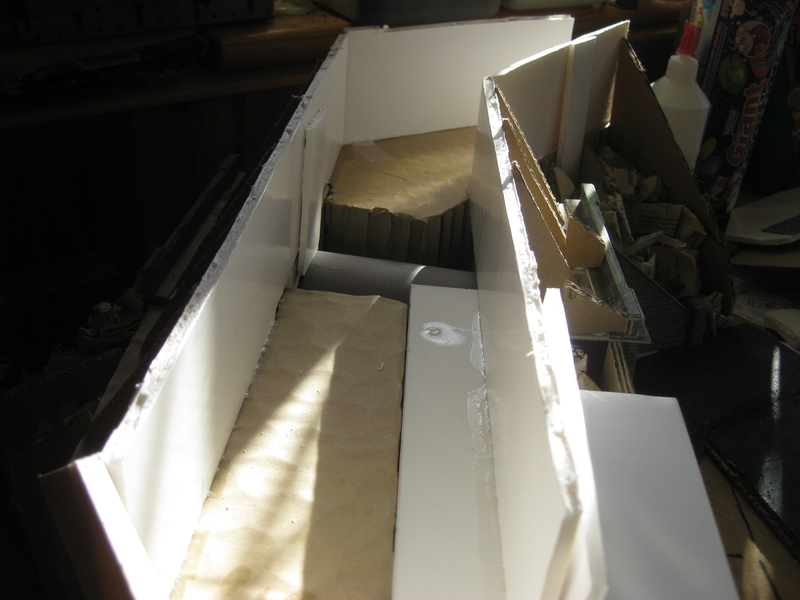 Another view of the embankment from above this time, showing the foam-board, which will be capped off to form the top.